As a precursor to our fairy/miniature gardening workshops we’ll be holding this spring, we thought we’d feature a few fairy garden DIY projects. Many of these projects are super easy and simple to do with minimal commitment of time and money. Since we will be focusing mainly on the planting and design aspects in our workshops, we hope these posts will be a nice introduction to the crafting side of this exciting hobby. You’ll start out by making the seat of the swing. Find a nice piece of bark that’s about 1/2″ thick or at least thick enough to have two holes drilled into it. Now that you’ve got the seat of the swing made, it’s time to move on to the frame. Once you’ve cut your twigs to the right length you can start gluing them together. The four long twigs become the feet of the swing, the medium length twig will become the top beam to which you tie the swing, and the short twigs will be braces on either side of the swing to help make sure it keeps its shape. Here’s a picture of the finished product! As you can see, the frame is easy to construct. Hot glue is a nice way to keep everything in place, but if you don’t have access to a hot glue gun, you can use regular glue as well. Once the glue dries, you could even get some dried grass or other natural fiber and tie it around each of the joints to add a little extra stability as well as a nice rustic touch. 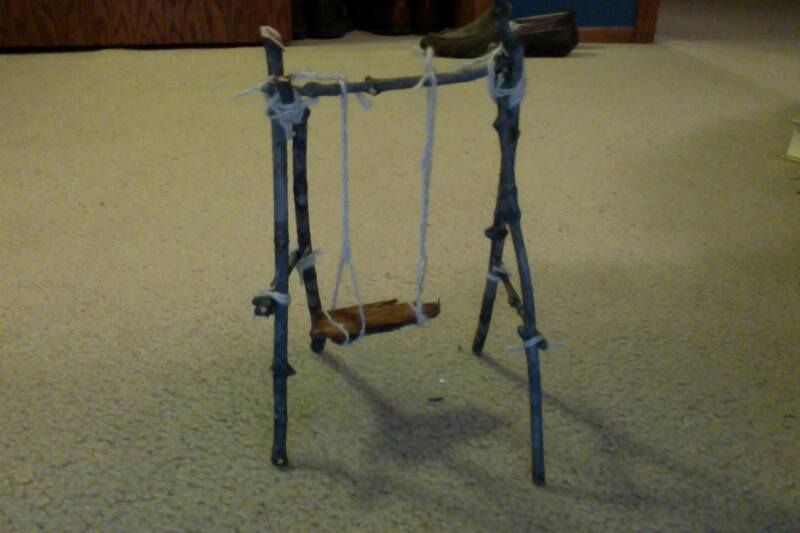 Here’s a swing one of our employees made for their fairy garden. And now you can add your new swing to your fairy garden! One of the great things about these types of crafts is that you can modify them to fit your tastes. You could paint your twigs if you want them to be more colorful. You could use colored yarn for the seat. You could get an old rubber ring and make a tire swing. The possibilities are endless! So get your imagination fired up and have fun making accessories!